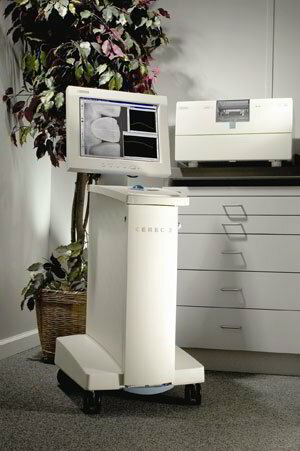 CEREC is a computer restoration system that allows us to provide accurate and natural looking ceramic dental restorations on the same day in Sebastopol Dental. CEREC tooth restoration gives patients teeth a more natural look than fabrications used in the past using silver or plastic fillings. CEREC tooth restoration is more durable and longer lasting than traditional restorations as well. Best of all, the entire procedure can be done on the same day so there’s no need for a return appointment another day! In the past, to offer crowns, veneers, inlays and onlays, you would have to wait around 2 weeks for them to be fabricated in a dental laboratory. This was often a deterrent for many patients and they would avoid accepting these most optimal treatment procedures. Modern dentistry has given us new and exciting options for dealing with the dental problems many of us face Without compromise in quality of material or overall function, we can now offer a more time efficient option to ensure your treatment is completed with little disruption to your busy schedule. At Sebastopol Dental, we understand your time is valuable and we have installed this sophisticated technology to provide ceramic restorative solutions without, temporary fillings and crowns and multiple appointments.. The state-of-the-art CEREC tooth restoration system is available to you when you need repairs or restorations including inlays, onlays and crowns on your teeth. You will always look and feel your best, and you’ll be completely satisfied when you look into these innovative dental health options. CEREC tooth restoration is more durable and longer lasting than traditional restorations. Best of all, the entire procedure can be done on the same day in Sebastopol Dental, so there’s no need for a return appointment on another day. CEREC tooth restoration uses the proven technologies of CAD/CAM (Computer Aided Design/Computer Aided Manufacturing) to incorporate a special camera, computer and milling machine into one instrument.After examining your tooth and determining the best course of treatment, the tooth is prepared for its restoration, similar to traditional treatment methods.We will then use the CEREC digital 3D infrared scanning system to create an optical impression of your tooth. This cutting-edge technology allows for a precise replica of your tooth structure to be created.Following this, specialised state-of-the-art CAD (Computer Aided Design) software and milling machine will design and mill every intricate detail of your restoration with extraordinary accuracy. Then we’ll bond the custom designed piece to the surface of your prepared tooth. ENHANCED AESTHETICS: Uses a high-quality ceramic material that is natural looking and colour matched to your teeth. PRESERVES YOUR TOOTH: The combination of the actual process and new bonding techniques enable us to preserve more of your healthy natural tooth, creating a stronger, more permanent result. SAVES YOU VALUABLE TIME: Because there’s no longer the need to create temporaries or take impressions of your teeth to send them to a lab, the traditional 2 week second visit necessity has been eliminated. The whole process is completed on the same day. BIOCOMPATIBLE MATERIALS: Materials are closer to enamel’s properties than any material in use today, so it’s compatible with the tissue in your mouth, anti-abrasive and plaque-resistant. PROVEN TECHNOLOGY: Tested for more than two decades, with more than eight million precise, safe and effective procedures done worldwide. An intra-oral camera is a highly advanced piece of diagnostic equipment that enables you to see on a monitor what we see during your examination. This allows us to point out areas of concern and explain in more detail exactly what needs to be done, such as restoring worn or broken fillings, cracked teeth, plaque build-up, cavities next to fillings and excessive tooth wear. This provides you with a better understanding of your current oral health. The intra-oral camera hand piece has a built-in light source and a miniature video camera with a 25 times zoom magnification so we can explain to you in detail what needs to be done and you can make informed treatment decisions with confidence. Still images can be stored so that we can compare changes at each of your examinations; they can also be printed and emailed if necessary. Rotary endodontics is the procedure of using nickel titanium files to achieve more effective cleaning of the tooth’s root canals. Unlike previous root canal treatments, using rotary endodontics is a painless and a-traumatic procedure. The procedure is quick; even multi-rooted teeth with complex root canal structures can be completed in a single visit. Devices such as the Morita Tri-auto XZ and Dentsply X-smart allow us to measure the length of the root canal electronically as we prepare them. These new techniques to close/obturate the root canals now produce more predictable results with no discomfort during or after the procedure. New local anaesthetic techniques mean that root canals are no longer a painful experience! All images taken in our practice are recorded digitally. We have a number of different types of cameras which we use to maintain treatment records and to help in diagnosis during treatment. Digital Intra-oral cameras are used to help identify and diagnose tooth fractures, wearing and deteriorating restorations, and dental caries. Digital SLR cameras with wide angle and macro lenses are used to give perspective and close-up extra-oral views. These are used in record taking before, during and after treatment. They create a digital record of treatment and outcomes and produce images which can viewed by patients and clinicians and help in determining treatment regimes and guiding aesthetic outcomes. All cameras have wireless internet connectivity and images are shown on screens for patients to view and immediately stored on patient files.